Inspired by the robustness of a climber’s haul bag, but designed for the brutality of the school or work commute, this utilitarian pack protects your stuff from rain, rough handling and the rigors of daily life. 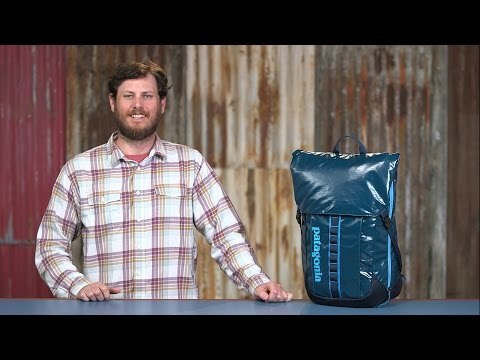 The abrasion-resistant, waterproof fabric is complemented by water-resistant construction, and the pack opens completely for easy loading and unloading. The internal sleeve fits most 15in. laptops and is padded to protect your computer from impacts. Fabric is polyester (50% solution dyed) with a TPU film laminate and a DWR finish for water resistance. Unique dual zippers for front or side access. Padded shoulder straps with a sternum strap for comfortable carrying. Small front pocket to hold your phone or keys. Moulded back panel sheds moisture and promotes airflow. Integrated fixed-top lid gives you access to the main compartment. Daisy chain lash points to attach yoga mat or skateboard. Compression straps cinch down your load.